What area(s) do you volunteer in? On Mondays, I volunteer in Admissions during the morning and Day Surgery during the afternoon. Why did you choose to volunteer at Morristown-Hamblen? I worked in Dietary at MHHS for 8 years before I retired. I liked it here and wanted to continue being around people and my friends. What is a random fact about yourself? I am a major Elvis fan and I like flowers. What is your favorite childhood memory? In high school, after Friday night football games, I enjoyed going to the sock hop (dance). It was fun! 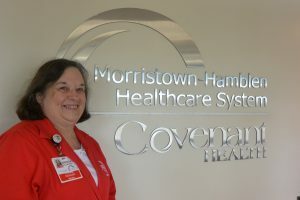 If you are interested in volunteering for Morristown-Hamblen Healthcare System like Brenda does, please check how to be a volunteer on https://www.morristownhamblen.com/volunteers.